Royal County Down has a terrific pedigree when it comes to big tournaments, having staged the Irish Open May 2015, the Senior British Open from 2000 to 2002. It also hosted the 2007 Walker Cup. Perhaps Northern Ireland’s most precious asset lies in the strength and quality of its golf courses. Around 100 golf courses serve a population of less than 2 million people. Northern Ireland may be the least populated of the four UK countries but it is the proud owner of two world-class golf courses and many hidden gems, all of which deserve close examination. But if you doubt the country’s golf course pedigree you should start by taking a look at the two Royal thrillers at Portrush and Newcastle. Royal County Down golf course has been voted the best golf course in the world by US magazine Golf Digest while Royal Portrush was placed at #27. In addition to Royal County Down Newcastle is also centrally located and within 45 mins driving distance of 12 other local golf courses. Running alongside the RCD, the course is laid out to the same menacing backdrop. it is not just as challenging as its vaunted neighbour, but it is a course to be enjoyed and not feared. 12 miles down the coast lies Kilkeel golf club, it is also situated within the confines of the Mournes with the picturesque, Carlingford Lough coming into view as well. The 18 hole, par 72 championship course, is a real test for the discerning golfer, but is also a haven to play relaxed golf in perfect surroundings. A few miles further on down the coast road heading towards Newry is another golfing heaven. 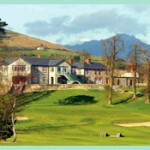 Warrenpoint golf club established in 1893 this 18 hole parkland course is set in the luxurious Hall Estate – this includes the famous Narrow Water Castle and is famed for its natural beauty. The club is proud to include former walker cup players Ronan Rafferty, Raymond Burns and Paddy Gribben as members. Sweeping out of Warrenpoint and heading inland through the Mournes is yet another park land course. Situated alongside old farm cottages, Mayobridge it can be described as quiet and picturesque. There are quaint water hazards and tricky greens to trip up the even the best of golfers (or golf players). Heading back towards Belfast a slight detour takes one to the course of courses in Ardglass which rambles along side craggy cliffs and folds that drop into the Irish sea. The course has been described as raw, rocky and dramatic with some spectacular holes cantilevered out to the sea. it is a popular course for American and Canadian visitors. Just a few miles inland from Ardglass is the majestic and sweeping parkland. The hilly Bright Castle Golf Course offers inspiring views of the east down coast line and boasts several taxing holes that require ever so straight hitting. Bright once laid claim to the longest hole in Europe – a monstrous 735 yards long, but this had to be reduced to 615 yards to comply with current rules. For sure after you play Bright you will have no trouble in sleeping. 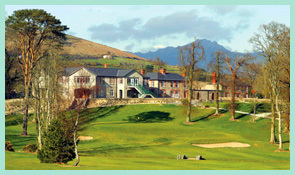 4 miles inland takes one to another classic and parkland course but has panoramic views of county down and beyond. Downpatrick course is built over the rambling Drumlins that are a geographical feature of this part of the world and the course designer obviously had a wicked sense of humour as one is uphill and down dale on a regular basis. 6 miles outside Downpatrick takes you to the 9 hole course in Crossgar – a popular retreat for beginners and low handicappers alike. this is another course which utilised the local topography to great effect and it can be a tricky venue to master. Leaving Crossgar and heading back in towards the coast line take one to an island of dreams. Mahee Island has perfect views of Strangford Lough and requires perfect accuracy from tee to green. the course might not be a long one, but it contains numerous pitfalls, especially with the wind blowing straight down the lough. Not that far away lies another feisty golf course. Kirkistown, better known for motor and bike racing is a delightfully pleasant course that appeals to all handicaps. It is always a well manicured course and always a welcome mat for visitors. Another few miles down the road towards Belfast takes you to yet another parkland diamond. The 18 hole course is a popular venue are for tourists and golfing societies looking for a tough challenge. This progressive club is always coming up with new ideas and last winter even held a tournament at night.